Almost 100 students voiced opposition to the removal of fine arts books and collection materials at the UT Fine Arts Library, FAL, town hall Thursday. The town hall was prompted by concerns about changes to the FAL, which has relocated more than 75,000 books, music scores and library materials over the past year. Douglas Dempster, dean of the College of Fine Arts, explained the college needs more space for innovation and programs in a four-page letter in October. At the town hall, students continued to strongly oppose changes to the FAL in the E. William Doty Fine Arts Building. “Destroying a collection is the farthest thing from anyone’s mind here,” said Dempster at the town hall when students began shouting. Since the number of materials checked out from the on-campus Fine Arts collection dropped from 216,000 to less than 100,000 in the last couple of years, Dempster said changing the library space to meet student needs is necessary. Sixty percent of collection materials have already been moved to storage facilities off-campus, according to an October FAL memo. The materials can be retrieved within three business days upon request. Students and faculty like Mary Ellen Poole, the director of the Butler School of Music, worry that moving more music scores and materials from the Fine Arts Library to off-campus storage facilities will hinder student learning by exploration. Grace Sparapani, graduate art history student, admitted FAL CDs and DVDs were no longer used on campus, but she said maintaining paper collections on-campus is necessary for student projects and research. Over the summer, the fourth floor of the FAL was cleared to create classrooms and offices for the School of Design and Creative Technologies. Grayson Rosato, theatre and dance sophomore, said he hopes to complete a future Bridging Disciplines Program certificate in design strategies. He said many students cannot register for the needed design classes because the lack of space in the College of Fine Arts limits the number of seats available. As Dempster explained that the University has said it will not fund the construction of a new building, students asked how they could get more University support for the college. He said two UT Libraries and a College of Fine Arts taskforce will assess how to resolve the lack of space. Editors's Note: This story previously said the College of Fine Arts offered a certificate in design and creative technologies. The design startegies certificate will actually be offered through Bridging Disciplines Program in the Fall of 2018. The College of Fine Arts will host a lecture series to better relate how degrees in the fine arts can be applied to health care reform. The lecture series is intended to expand the ways in which art degrees can be applied to health care, according to Holly Williams, associate dean for College of Fine Arts. Each speaker will address applications of art, such as design, dance and music therapy, to different fields of health care reform. Guest lecturer Stacey Chang, an independent strategic advisor to entities trying to change health care, will discuss how design affects the health care environment, such as the psychological effects of hospital lighting on patients, according to Williams. “He believes there’s potential for rethinking a lot of things that we just take for granted,” Williams said. Guest lecturer David Leventhal is the program director for Brooklyn-based dance studio Dance for PD, which he helped found to better treat people living with Parkinson’s disease. Patients partake in therapeutic dance classes which help alleviate the pain the disease causes, according to Williams. “Parkinson’s patients feel so trapped in their bodies, that this is a way for them to feel like their bodies are still working with them as opposed to against them,” Williams said. Dance and economics freshman Lizzy Tan said she has an interest in health reform as a fine arts student. In 2013, she hosted a dance benefit for the Alzheimer’s Association, and she has volunteered at nursing homes throughout her life. “I have always had a strong interest in nonprofit work, and I am very interested in how the arts can be used to provide therapy for certain people,” Tan said. Douglas Dempster, dean of the College of Fine Arts, said the lecture series is meant to inform students of the possibilities to apply their art degrees to practical fields, such as health care. The series will begin next Wednesday at the Bass Lecture Hall. Due to University-mandated budget cuts and a deficit within the College of Fine Arts, the school has been forced in the previous months to freeze admissions to some of its popular degree programs. The University’s musical theatre, music business and musical recording technology programs are among those affected. While this won’t affect students already in the programs, it will leave them inaccessible to future generations. The cuts have also eliminated ceramics and metal-working studios. In a city as arts-driven as Austin, the local community college shouldn’t be the only institution still admitting to music business and recording technology programs. In an interview with the Texan in December, Fine Arts Dean Douglas Dempster noted that the freezing of the music business and recording technology programs was an unfortunate step toward a planned Center for Arts and Entertainment Technologies. The center would offer a Bachelor of Arts and would include offerings in gaming, digital arts, art management and more. But Dempster is worried that further budget cuts and restrictions this year could result in eliminations of more facilities and programs. And rightly so. The hedging of fine arts programs as a result of budget restrictions is nothing new. When it comes down to it, degree programs in the arts are among the first to get slashed when funds are tight. But universities shouldn’t be so quick to axe arts programs. Even in times of fiscal austerity, universities should still fight to preserve programs in the fine arts. The positive benefits of the fine arts are undisputed. As a 2012 study funded by the National Endowment for the Arts found, at-risk high school students with no art credits were five times less likely to graduate from high school than their fellow students with art credits. While this doesn’t apply directly to a university setting, it is clear that the arts foster a positive outlook on education by means of self-expression and interaction with a final product. So then it’s incredibly short-sighted that the only college music business and recording programs in the “live music capital of the world” are at ACC, which only offers associate’s degrees. There’s something to be said when a college in a city with SXSW, ACL and many businesses dealing with entertainment is forced to shut down its degrees marketable to this industry. 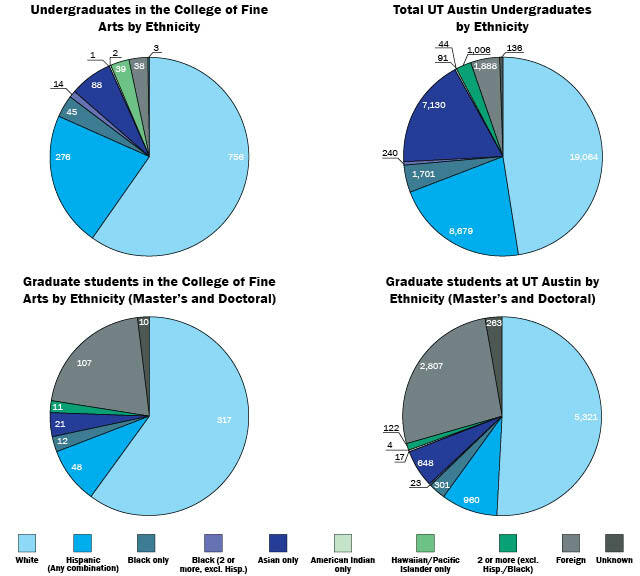 With the changing job market, most universities, UT included, have put a new emphasis on science, technology, engineering and math at the expense of fine arts programs. The overwhelming demand for STEM graduates overshadows the importance of the arts in the eyes of education officials. The world today needs scientists and engineers, but a greater emphasis must be placed on giving students as many options as possible to pursue their passions. The University of Texas cannot be a STEM degree factory. Due to budget cuts, the College of Fine Arts has been forced to freeze popular programs with fears of not having the means to reinstate them in the future. The college is attempting to move forward by means of upgrading facilities and degree offerings, but cannot do so when they are struggling to stay afloat as it is. The University needs to start taking its fine arts programs more seriously. The musical theatre program in the College of Fine Arts is being put on hiatus because of budget cuts from the Office of the Executive Vice President and Provost. Brant Pope, Department of Theatre and Dance department chair, sent an email to faculty and musical theatre students in November to announce the decision. The program will no longer recruit incoming students, but students currently enrolled will continue in the program until graduation. Pope said in an email that the cuts are coming from the provost's office because the office requires the department to self-fund merit salary increases for professors. The money to fund these salary increases requires cuts to programs — such as the musical theatre program. The Office of the Executive Vice President and Provost has required the department to cut its budget by $400,000 over the last five years, with $80,000 in cuts this year, according to Pope. These budget reductions had previously resulted in a loss of 25 graduate TA and AI positions, a reduction in faculty positions, and the master's acting and dance programs ending recruitment in 2012, Pope said. “I am very discouraged and exhausted from these relentless budget reductions and many of my senior faculty have protested these devastating losses we have suffered for the sole purpose of funding merit salary increases,” Pope said in an email. Like the master's acting and dance programs, the musical theatre program is being put on hiatus, which Pope says is different than removing them. According to Pope, cutting the musical theatre program is negative for the department because it is an increasingly popular form of theater with a variety of career outlets. “The Music Theatre program was chosen because it is still a young and small program and most importantly because it is an exceptionally expensive program to support,” Pope said. First, it is indeed lamentable that two programs in music have been terminated. But given the intense pressure to reduce expenditures, I can understand why Mary Ellen Poole, director of the Butler School of Music, has targeted programs largely (though not entirely) taught by non-tenure track instructors. However, it would be incorrect to assume that UT-Austin is insensitive to a rapidly changing cultural market. Last year, the Texan published a report on the formation of the new Center for Arts and Entertainment Technologies, of which I am the director. This is a very exciting and forward-looking program that hopes to admit the first cohort of students into a BA in Arts and Entertainment Technologies (BA-AET) in the fall of 2016. The center is also working hard to create deep and lasting relations with cultural enterprises in Austin and beyond toward a truly integrated learning experience for these students. We envision numerous internships and company-sponsored research initiatives for all the undergrads in the new program. We are also embarking on a project with the Fine Arts Library to provide new resources not just for College of Fine Arts students, but for the entire student body. We are calling this the Creativity Commons. In the near future, all UT students will be welcome to explore and develop their own creative projects within the commons. We intend that many of these resources and activity units will be company-sponsored, thus providing new career opportunities. All this is to say that while the Butler School of Music has chosen to make certain kinds of decisions in support of its mission, the College of Fine Arts and UT-Austin at large are acutely aware of the growing student demand in arts and technology and have responded with the formation of an entirely new center and degree program. — Bruce Pennycook, music professor and director of the Center for Arts and Entertainment Technologies in the College of Fine Arts, in response to last week’s coverage of the suspension of the Butler School of Music’s music recording technology and music business programs. The Butler School of Music appointed Mary Ellen Poole as the school’s director Monday. Poole will replace Glenn Richter, who was named interim director in 2012 when former director Glenn Chandler resigned under pressure from University leaders after advocating that the school should be separated from the College of Fine Arts. Poole has been the dean of the San Francisco Conservatory of Music for 10 years. She attended Baylor University and Michigan State University and has a Ph.D. in musicology from the University of Illinois at Urbana-Champaign. The Butler School of Music currently has 380 undergraduates and 320 graduate students. In a press release, Doug Dempster, dean of the College of Fine Arts, said Poole’s experience as a scholar and musician made her qualified for the position. “As dean of the San Francisco Conservatory of Music, Mary Ellen Poole put up an extraordinary leadership record, turning a very good music school into a great one,” Dempster said in a press release. Poole, who will hold the Florence Thelma Hall Centennial Chair in Music and whose appointment will be effective Sept. 1, said the position at the Butler School of Music was a great opportunity. “It’s a great honor to be welcomed by this remarkable group of people at this equally remarkable moment,” Poole said. After receiving intense backlash for the decision to stock a main-stage show with professional actors, the College of Fine Arts has recast its upcoming musical, “In the Heights,” with minority students at the University. Beyond recasting, the college also hired an entirely new creative team. In October, The Daily Texan reported that nine of the 12 lead roles in “In the Heights,” a musical which follows 12 Dominican-American teenagers living in New York, had been given to professional actors. At the time, the musical’s director said the decision was made because of the limited number of students of color in the department. Producer Brant Pope, chair of the department of theatre and dance, said the department has gone beyond recasting the musical — they also brought in a new creative team, including a new director, choreographer and musical director. Pope said the new team was better equipped to cast diverse actors, in part because the director and choreographer are Latino. Pope said the audition process this time around was open to students of all majors. Cassie Gholston, director of marketing for the department of theatre and dance, said the number of undergraduate students who are awarded roles has increased tremendously from previous years. From 2012 to 2013, there were 33 main stage roles, 33 percent of which were given to undergraduate students. This year, there are 72 main stage roles and 94 percent have been given to undergraduate students. “There has never been a time when it’s been more exciting to be an undergraduate theater major,” Pope said. Theatre and dance freshman Trey Curtis, who was originally cast in an ensemble role, was recast and will now portray one of the main characters. Curtis said he was thrilled to audition again when more parts for students opened up. Though Curtis said he was excited more roles opened up, he was not originally bothered by the number of professional actors cast. Theatre and dance sophomore Max Torrez said he was taken aback by the original decision to fill the majority of the cast with professionals. The play, written specifically for Latino actors, opens up many doors for minority students, according to Torrez. Music professor Bruce Pennycook was appointed late October to the new role of director of digital arts for the College of Fine Arts, and is in the midst of redesigning the college’s interdisciplinary programs and course offerings. Pennycook will oversee the college’s efforts to provide opportunities for interdisciplinary study and collaboration. New courses and facilities will integrate technology and art to create a range of possibilities for progress, including 3-D printing labs and advanced digital technologies that would allow choreographers to work with virtual dancers. Pennycook was tapped for the position, in part, because of his experience as panel chairman of the Bridging Disciplines Program in digital arts and media — an interdisciplinary fine arts program that allows students take a mix of courses in computer science, fine arts and the humanities. Pennycook said the programs have provided an “ideal model” for interdisciplinary study and insights for the upcoming changes. The changes will come at the expense of older art programs, said Dempster. A ceramics and metals workshop is being refurbished to make way for a new high-tech digital fabrication lab, and advanced metals courses are being dropped in favor of new offerings. The college also aims to construct a “creative commons” that provides students with audio and video editing technologies, among other resources. “I’m excited that the College of Fine Arts is going in a new direction that acknowledges the art of the time, but I’m also disappointed that they have to do it at the expense of traditional programs,” studio art freshman Connor Frew said. Dempster said his department is working to strike a balance between new and old artistic techniques that incorporates the insights of traditional techniques while creating an environment ideal for progress and innovation. On Tuesday, faculty members and students of the College of Fine Arts addressed concerns surrounding the casting of performers from outside the University for the department’s upcoming musical. The department decided to contract guest performers of color for “In the Heights” because most of the characters are Dominican-American, and faculty members were concerned there were not enough students from appropriate ethnic backgrounds to fill the roles. ​You can read the full story regarding the forum here. Below are ethnic breakdowns of the College of Fine Arts compared to the ethnic breakdowns of the University as a whole. The information is compiled from the Office of Information Management and Analysis.